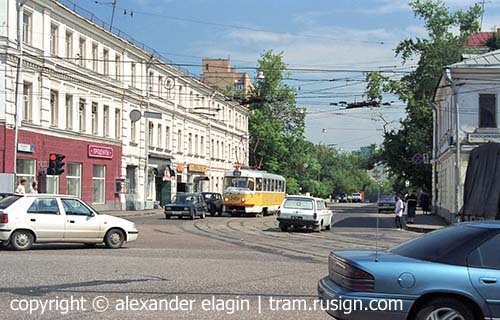 A tramline along Lesnaya Street is of the same age as the electric tram of Moscow. It was constructed in 1899 and at first it was a single-track auxiliary line. In 1904 it was reconstructed for passenger service and operates since that time. 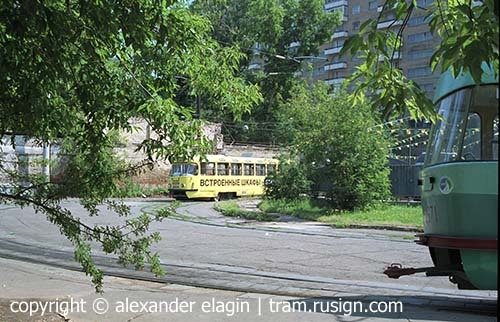 There is an oldest mass transit depot of Moscow - Miusskiy Park - in Lesnaya Street. 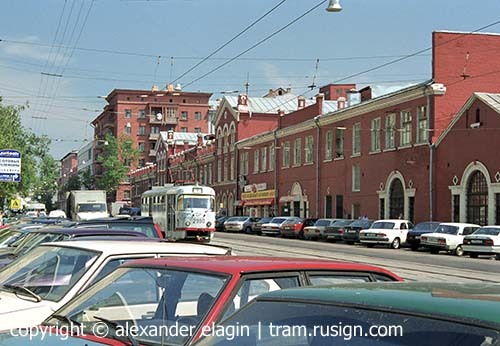 There was a parking facility for horse-drawn cars here since 1874, then it was rebuilt for electric tramcars, and now it handles trolleybuses. The last tram came out of this depot on 11 November 1957. A tram ring in Lesnaya Street. This terminus was opened on December 28, 1984. It replaced the ring closer to Gorky street - there were built new fashionable houses there, and tram 'did not fit into the environment'. 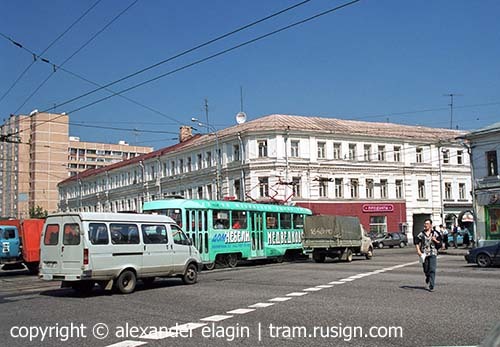 A vast building of the former Miusskiy tram depot in Lesnaya street, now being a trolleybus parking. Yet the tramline is still here. A crossroad of Lesnaya and Novolesnaya streets. There is an interesting museum in the old building across the street: an underground printing-shop where proclamations were printed during the Russian revolution of 1905. The trench nearby represents a new age of Russian history; probably, a new office-tower for 'new Russians' is being built. 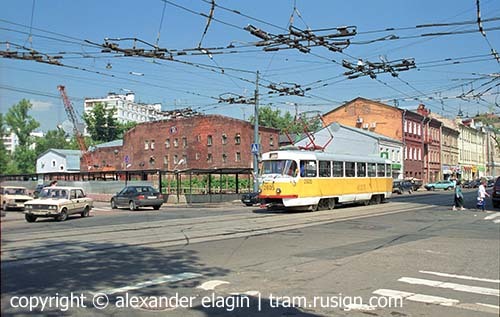 Here the tramline crosses Novoslobodskaya Street and goes to Palikha Street. A mysterious even for Muscovite name of the street is decoded very simply: two centuries ago this place was called Polikha - "a field place". The field was gone, and the Moscow pronunciation - to read A instead of O - did for the rest. Palikha Street slopes down to Sushchevskaya Street. Long ago there was Neglinka river there, now it flows in tubes.